In this post, I want to address a couple of things. First, what is this blog about? Well, it's kind of evolved from having no point whatsoever to focusing on my former handbag and accessory business, Burst of Happiness, to focusing on my personal crafts/sewing/pattern making/etc. As you know, sometimes I write about things I've made, sometimes I write about things I observe or life in general. Sometimes it's boring, sometimes it's funny. Somehow, a few of you stick with me no matter what. I appreciate that. Where am I going with this? Well, as you now know, I'm pregnant. And I think that some of you don't visit my blog to hear about baby stuff. Maybe you want to see sewing projects, or who knows what. The sewing projects have been more sparse since I've been feeling rather lousy, though I'm starting to feel better now. Some of you may not really care what I write about; you just think I'm fantastic. Thanks for that! OK, maybe not. But the point is that I see this blog as just being about whatever I'm doing. And what I'm doing is making a small human, so this could frequently be the topic du jour around here for a while. I'll definitely be squeezing some other stuff in. 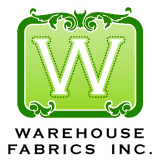 I have some knitting projects I'm finally finishing up, and I always have my weekly sewing projects for the Warehouse Fabrics Inc. blog that I'll share. For now, I'm going to make you look at my baby. 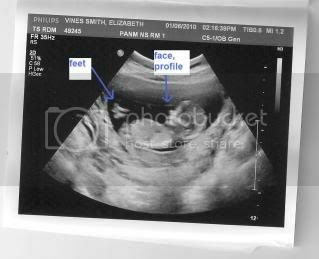 And my uterus. I realize that many people may not like this kind of thing. This is "Gummy" at 13 weeks. I like to think Gummy is smiling in this picture. I always wondered if pregnant women share some sort of natural bond with one another! Awwww! Definitely a smile! That's for sharing your baby making adventure, I love it!